The need to differentiate your offer through specialization, verticalization, and intellectual property is something very important to me for some very personal reasons. Sometimes it’s easy to forget that technology has a direct impact on our lives, until it does. Let me give you an example. In 2014, my husband and I discovered that our unborn son had a blockage in his bladder that causes kidney malfunction, making it impossible to survive outside the womb. The in-utero surgery that was needed had only a 2% chance of success… but it saved my son’s life. What I learned through this experience is that the stress of what we went through during the pregnancy was nothing compared to what we went through post-birth. The complexities of our hospital systems are staggering and largely unnecessary given today’s technology and solutions. With his condition, my son has five different doctors within one hospital system. To communicate with one another, these doctors rely heavily on email and cell phone pagers. In one case, it took us five days to get ahold of our primary doctor right before we were going into surgery. In another instance, a doctor couldn’t get the real-time exams to upload on her computer. And while I was sitting there talking to the doctor, I realized that these problems are fixable with the power of the cloud and the power of our partners. The challenge hospitals face in providing timely, patient-centric care is daunting. 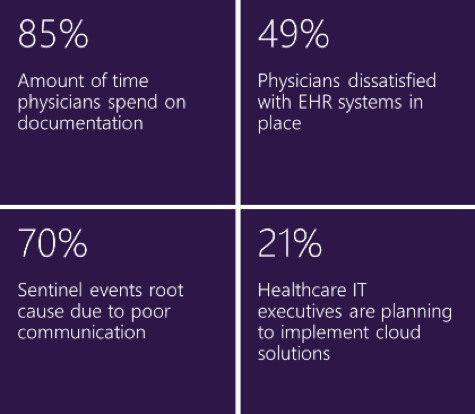 In many cases, they don’t have the cloud infrastructure, their communications systems are fragmented, the patient record system is decoupled, and regulatory compliance requirements sap productivity. A virtual care experience – people want access doctors and medical staff at any time from their mobile devices. Employee productivity – giving doctors and medical staff the ability to connect seamlessly, freeing up the time to work directly with patients. Creating a patient-centric outcome – medical care that results in outcomes important to the patients, not hospitals or doctors. Connected smart devices – connecting medical staff to each other and to the resources they need through the Microsoft Cloud. Specialization is key – Remember that you don’t have to be great at everything all at once. It takes time and money to get there. Pick a vertical – Decide which industry to focus on first and build repeatable solutions that increase your efficiency and expand your geographic reach. Build intellectual property – Create the stickiness for your practice that generates more value and commands higher price points. Removing blockers for the customer: In specific industries–an in specific geographic locations within industries, there are unique blockers. For healthcare, it might be a need for ISO certification. Building valuable knowledge around a specific need can help the customer overcome that blocker. Deep industry-specific knowledge: Building knowledge of a specific industry gives you the ability to come up with targeted solutions, like care coordination or patient engagement solutions that you can begin to sell as month-over-month services. Word-of-mouth marketing: Happy customers tend to talk with other organizations within their vertical, which can grow your business. When Wortell looked at healthcare, security and privacy were very important, along with high up-time, and scheduling, especially for home care organizations. So Wortell now provides their own set of solutions on top of the Microsoft stack for those specific needs. Building toward differentiated, packaged offers takes time, but the payoff in higher margins and increased customer satisfaction make it a worthwhile journey. We refer to that journey as the IP staircase. The journey starts with managed services which allow you to start driving repeatability and scale, and ultimately more revenue. The next step is labeled bundles, or the packaging of individual products and services, to make it easier for customers to realize the better-together functionality of our services. And climbing up the profitability staircase, you could expand to packaged extensions, where you start partnering with ISVs to add their applications or devices to your offer. For example, wearable IoT devices with built-in activity monitoring have huge potential in healthcare. Once you’ve done that, you can start putting together a fully functional and differentiated solution. Finally, when you established some sales motion behind that solution, you can think about customizing it for discrete vertical markets. Coming back to our healthcare example, this might work in the following way when it comes to dealing with regulatory compliance and requirements. You could differentiate with HIPAA-compliant secure email and file sharing using Office 365, then couple that with Skype for Business, offering voice and video conferencing to make the care team members more productive. To ensure secure access to patient files from any device, you can add in Enterprise Mobility Suite, and to deliver analytics-based insights, you can build customized views with Power BI. As you can see, I’m personally passionate about the opportunities in the healthcare vertical, but you should follow your passion. Assess your customer portfolio to understand where you can target your focus and then innovate and differentiate with your solutions. You can even leverage other partners’ expertise to create a truly revolutionary offering. Share your thoughts on this and other opportunities to specialize within the Microsoft Partner ecosystem. Join the conversation with the partner community here.